Home energy efficiency is about using less energy to provide the same level of comfort. This can be achieved through better technology, with products like Energy Star appliances and LED lightbulbs, or changes in behavior such as using a programmable thermostat. More efficient energy use means lower utility bills, less dependency on fossil fuels, and pollution reduction. Purchasing Energy Star appliances, equipment and lighting can cut energy costs by up to 30%. No-cost energy savers include turning off electronics and unplugging chargers when not in use, lowering the temperature on your water heater to 120 degrees and washing clothes in cold water. When you make energy efficiency part of your everyday activities you are saving money, reducing energy demand and creating fewer greenhouse gases. In Maryland, as much as half of home energy goes to heating and cooling. Duct sealing, improved insulation, and plugging leaks from windows, doors, attics and crawl spaces are very effective and affordable ways to improve the efficiency of your home. A good first step to reducing home energy costs is to pinpoint any problem areas. BGE and Pepco both offer home energy audit programs at discounted rates. Their Home Performance with Energy Star programs offer comprehensive energy audits for $100, an estimated $400 value. The audit report will recommend specific upgrades as well as estimates for their cost and payback period. In addition to the audit results, customers can realize immediate savings with free LED light bulbs, water heater pipe wraps, showerhead adapters, faucet aerators and power strips. These can be installed the day of the audit with the home­owners permission. All contractors are vetted and approved by the utility companies. To learn more and sign up directly through the utility companies, use these links for the BGE and Pepco home energy audit programs. If you want even more personalized service, you can talk to a third-party energy coach who will help you navigate the process. Saving energy can be very simple, like turning off lights when you don’t need them. Or it can range into more extensive ideas such as doing a home energy audit to find opportunities to make your home more comfortable, efficient, and cost less to operate. Or they can be somewhere in-between. The following is a list of No-Cost Options, Low-Cost Options, and Strategic Savings. Strategic Savings means that you might have to put more time and money into them, but they will be worth it! Reduce waste by turning off lights and appliances when you aren’t using them. Eliminate obsolete or unused fixtures. Unplug appliances or chargers when not in use. Turn down your water heater set­ting to 120 degrees Fahrenheit (or 140 if your dishwasher does not have its own booster heater). A ten-degree temperature reduction on a water heater saves 3 to 5 percent in annual operating costs. Turn water heater settings down to “vacation” or “stand-by” if the house is to be vacant more than two days in a row. Try reducing your furnace’s thermostat setting to 68 degrees– or at least turn down the furnace when the home is unoccupied. Try turning air conditioner settings up to 78 degrees. Again– avoid running the air conditioner when the home is unoccupied. During the summer, either run the air conditioner or open your windows– don’t do both at the same time. Close the vents or radiators to rooms that are not regularly used. Be sure there are no appliances located near a thermostat– these appliances give off heat that will bias the temperature setting and space heating or cooling performance. Close window coverings on hot summer days on the side of the house that receives direct sunlight. Open window coverings on cold winter days on the side of the house that receives direct sunlight. Hang dry clothing inside a spare bathroom especially in winter when household air is dry. Use the power settings on your computer to have the machine hibernate or sleep after a certain length of time. Regularly service the appliances you already have. Have annual maintenance performed on big appliances: change filters in air conditioners, have combustion tune-ups performed on furnaces, boilers, and water heaters. Shop for energy suppliers. Start by using the Maryland Public Service Commission’s website to find information about electricity and natural gas suppliers. Weather seal doors and windows. Find gaps and penetrations in walls on cold winter days, especially around penetrations for pipes and wires. Fill these with expandable foam, caulk, or other durable sealing material. This will reduce air movement and also cut down on spi­ders, ants, and other small bugs. Use ceiling fans instead of air condition­ing on moderately warm days. For any light fixtures that are used more than two hours per day, install compact fluorescent bulbs instead of incandescent. Install occupancy sensors to control lighting in areas where lights tend to stay “on” unnecessarily. Install low-flow aerators on water faucets and showerheads. Install and use a programmable thermostat. You may qualify for a free one if you sign up for BGE’s Peak Reward’s program. When it’s time to add or replace a major appliance, look for an Energy Star logo and the yellow Energy Guide performance indicator. Do a little research on appliance choices at www.energystar.gov. This website shows annual operating cost estimates for various models of many appliances. Get an energy audit and follow up by implementing the recommended projects. 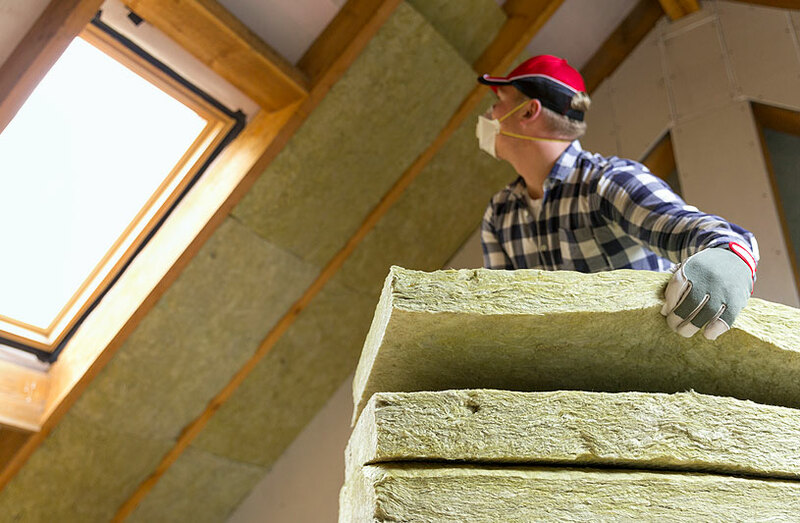 Insulate walls and ceilings. Do this in the attic as well as the basement sill joist cavities. Insulate air distribution ducts. Also, insulate hot water distribution lines, especially the sections located closest to the water heater.